A well crafted life purpose statement serves as a compass for keeping you on track, enabling you to create a strategic life plan–a personal blueprint-that acts as a guide to help you fulfil your life purpose. You know what to do when faced with major decisions? Can more easily say no to things that don't line up with your life purpose? A personal map you can use to satisfy the "Itch" to find what you're "supposed" to be doing, eliminate the stress of indecision, and chart your course toward making a difference and fulfilling your call, without doubt, or second guessing, or being made to feel selfish or silly! Feel like you're just going through the motions and getting nowhere. Spend day after day working in a job that drains or stresses you out. Hope there's more to life than this but don't know what it is. Discover your life purpose & identify your God given call so that you can start living life ON PURPOSE & actually do what you were put on earth to do! When you know WHAT you're doing and WHY, it's easier to keep going when times are tough, or when you encounter opposition or criticism. When you know your life purpose, even if things aren't going as well as you'd like, you're still motivated and still look forward to doing it. Rick Warren's book The Purpose Driven Life sold 30 million+ copies. His book was named as one of the top 100 Christian books that changed the 20th century! People are hungry to know their life purpose. You're living proof! Give you a reason to get up in the morning, every morning! Get you out of "the rat race"
Keep you on course and on track. Go from making a living to making a real difference! Knowing your life purpose frees you from needing to compare yourself with other people who have a different focus and purpose for their life. That can be such a drain. Just because somebody you admire is doing something worthwhile that doesn't mean to say that you need to be doing it too. Knowing your purpose gives you a sense of direction. It helps you line your life up with your true values and make better decisions. When you reach a fork in the road you can confidently choose the path that's leading in the right direction. You don’t need to stew over decisions because when you know your purpose and you have a clear destination you know whether or not it's the right thing to do. If you're made redundant, wondering what next, able to retire early but know that you’re not yet done, and you're wondering what you’re going to do with the rest of your life, knowing your purpose will enable you to make wise decisions. Knowing what you were put on earth to do gives you the confidence and courage to more easily say no to things that will take you off course or off purpose. An inspiring coaching program that enables you to clearly identify your God-given design, your core passions and motivations, and how your whole life has prepared you for what God has called you to do. This purpose discovery program equips you to understand what God made you for, and what He put you on earth to do. Each coaching session is specifically designed to help you dig for treasure. The powerful coaching exercises direct your steps as you discover what you are uniquely designed to do. The coaching demonstrates how to draw your discoveries together so that you can create your own personalized life purpose statement, a "road map" that will help you make better decisions for the the rest of your life! And provided you take focused action and follow the steps outlined in each session you will be able to craft a powerful life purpose statement that will enable you to more easily navigate the twists and turns of life. This is a rare opportunity to receive professional destiny coaching at a fraction of the normal cost. First I guide you through an extensive brain dump! This enables you to glean valuable information from your life up until now. This is where you evaluate your gleanings and identify what you have learned so far about yourself and your destiny. Then you'll add to your gleanings and begin to identify the most significant insights and categorise them. Deeper exploration! You will identify patterns and themes, note convergence experiences, and draw together what you have learned so far. This is where you get down to specifics. What you sense God wants to do, how you want to be remembered, and who you want to help. You will identify what the coaching exercises have revealed about your life purpose so far... and then you start to identify your calling. This is where you evaluate what God has been showing you and draw everything together to craft a compelling life purpose statement that acts as a roadmap to steer your life by. Are you ready to live your life on purpose? To coach clients to their destiny usually takes from 6-8 coaching sessions. The Lord led me to offer group coaching so I could significantly reduce the cost and make this crucial coaching tool more widely available. YES! I'm Ready To Discover My Life Purpose & Identify My God Given Calling So I Can Live Life ON Purpose & Do What I Was Put On Earth To Do! I understand I will be billed $247 $100 (£200 £80) today to receive immediate access to all the How To Discover Your Life Purpose coaching materials. You can checkout using PayPal. Alternatively, if you don't have a PayPal account, you can check out as a guest and pay using your credit card. When you KNOW what you were put on earth to do it's much easier to focus, and concentrate time and energy on what's most important. "Will this help me fulfil God's purpose for my life?" Please use the buttons below to share with your friends so that they can discover the keys to fulfill their life purpose too. 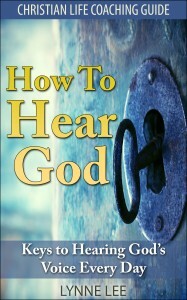 How To Hear God: Available in PRINT and on Kindle!! God is a loving Father whose deepest desire is to have a two-way conversational relationship with the apple of His eye, His beloved creation, that's YOU! And through Amazon worldwide. There is a link to free bonus resources in the book. The free resources are included for people who want to go deeper with God, and they are worth way more than the price of the book! I trust that you will be richly blessed.